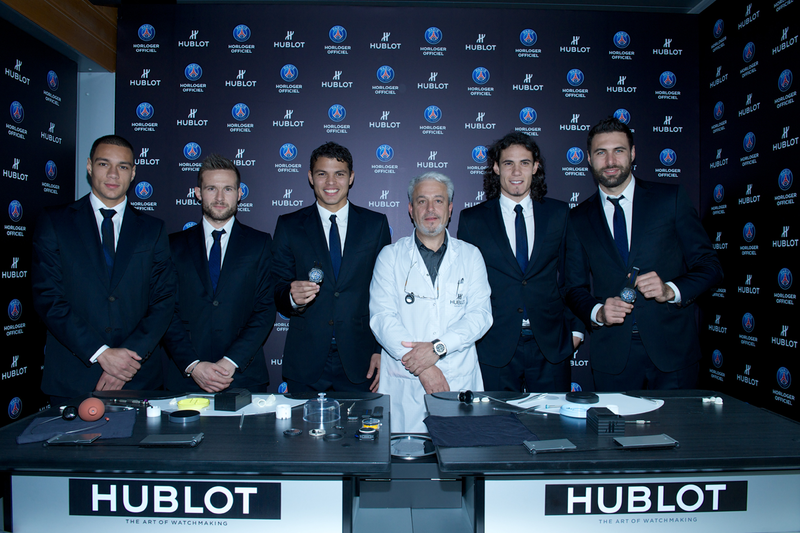 In September 2013, we informed you about HUBLOT being appointed Official Timekeeper and Official Watch of French 1 champions, Paris Saint-Germain. 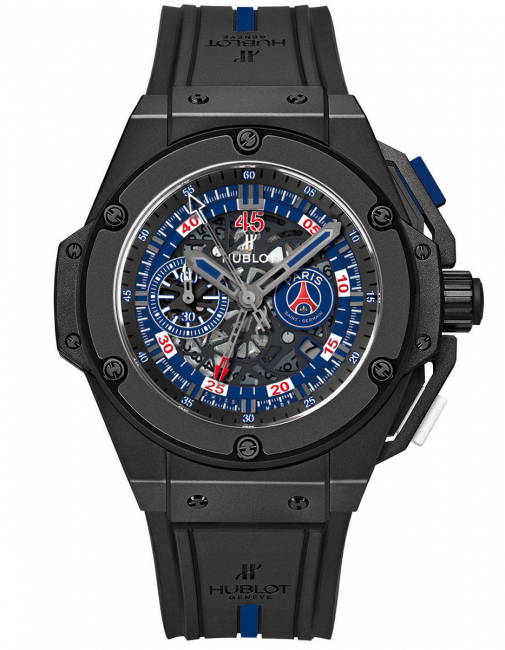 This week Hublot unveiled the watch that will embody their partnership with PSG, in the form of the new King Power Paris Saint-Germain, that using blue and red, pays tribute to the official colours of the club. Power equipped with a chronograph movement featuring two chronograph hands positioned in the centre, in addition to the hour and minute hands. This makes for better readability – quicker and more efficient. The wearer can keep track of both hands at a glance; the first indicates the seconds, and the other hand, specially developed for football, indicates the time elapsed out of the 45 mins in each half. With a sapphire dial, the movement – here in an Aero Bang version – features exquisite new skeleton working to reveal even more of the working parts of the watch and its fine mechanics. The topside retains only the material necessary for it to function. This is coated with black ruthenium for a beautiful overall effect of homogeneity, and clearer reading. A minute track, a time counter at 9 o’clock and a date window at 4 o’clock all feature on the predominantly blue piece, which is stamped with the famous Parisian emblem incorporating the Eiffel Tower. The chronograph is available in a limited edition of just 200 numbered pieces. Each watch comes with a certificate guaranteeing its authenticity and an official Paris Saint-Germain shirt signed by all the players. The King Power Paris Saint-Germain was launched in the presence of players Gregory Van Der Wiel, Yohan Cabaye, Thiago Silva, Edinson Cavani and Salvatore Sirigu, who were invited to take part in a Hublot Watch Academy workshop, with assistance from a professional watchmaker. Black composite resin with push-piece guard at 3 o’clock.